Are you defined by who you were born to or who you choose to become? Theodora "Teddi" Donovan's overprotective grandmother forbids her to see Calvin Wynne, an orphan tied to their family's shameful past, but when they find a way to see each other without the iron-fisted woman knowing, Teddi and Calvin fall in love while discovering there are much darker forces in their sleepy town threatening to pull them apart. 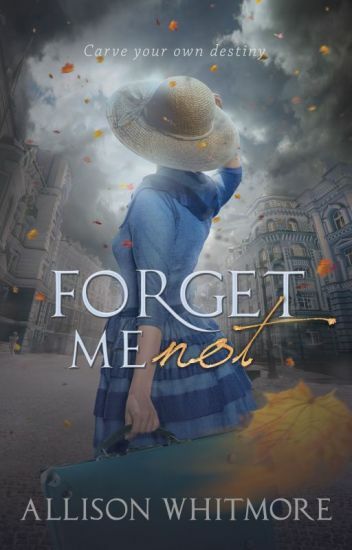 Forget Me Not tells the story of the people we can't help but love no matter how much the world tells us not to. Forget Me Not, Books I and II are posted together and the first two novellas of three. Book III will be up again after a long hiatus soon! The tale of Persephone is well known throughout Greek Mythology, however, the real tale hidden beneath the myth of a Goddess stolen away from her mother is that of Alena Cali - the Cursed Siren. Forever cursed to lure sailors to their deaths with their beautiful voices, Alena is banished to live out her days on Cape Pelorum in servitude to the gods for the unpayable debt she earned in losing Demeter's daughter. Now powerless to the curse that causes her to drag innocent men to their watery graves, Alena sees no escape from her doomed existence. However, when the opportunity to save Persephone arises, she only has one option left: gain the help of a lone sailor to right her wrongs, or lose her friend to the clutches of the Underworld once and for all. A holiday fantasy story told in two parts. Book I: An empath teenager discovers a magical world beneath her family hotel and new friends who just might make life worth living again. That is, if the mad man who is twisting her mind in knots, doesn't get to her first. Fall into the world of secrets, Empaths, morphlings and fair folk with Isabella Foxworthy and her friends: Seth Logan, the guitar-playing jock who just can't leave her alone, his brother Micah, and the overly indulged but genius twins, Cleo and Xander. Please note: this is the first draft. The fully proofread draft was published. I'll try to post it someday soon. Book II of The Lost Heir series is a DIRECT continuation of Book I. Join Isabella, Seth, Micah, Cleo and Xander on the rest of their journey as they attempt to find the lost heir, save the violet fire and learn to juggle their new powers as empaths over the holidays. --Watty winner-- In Victorian London, monster hunting isn't just a job, it's a way of life. Freddie Westman, a reporter for a paranormal magazine, is one of the best in the business, but now it's personal. His childhood friend, Jim Penderry, has disappeared, and the signs point to sinister forces from beyond the grave. If Westman wants to save Jim, he'll have to face his worst fear. No, not fighting a demon with only a cake to hand. Something far more daunting. Sceptical Sophie Penderry doesn't solve mysteries or go on adventures. She's more at home in the library with her nose in The Botanist's Guide to Plants and Fungi. But she puts the science books away to help Westman find her missing brother, whether he likes it or not. Which he really doesn't. Westman is a loner, reluctant to lead anyone into danger. According to him, the supernatural is not just the stuff of folklore and children's nightmares, and a world of black magic awaits them. Now Westman must decide if he should push Sophie away for her own safety, or take a leap of faith and accept an offer of help and friendship. Either way, time is running out to find Jim, and worse still, they may not make it back in time for tea and biscuits. As the heiress presumptive of Monrique's largest duchy and a Lady Justice in training, Lady Therese De Beauharnais of Roche has her hands full with her duties, studies, and of course - fending off all her suitors who seem to be only after her money and her body. However, as her father, the Duke of Roche, inches towards his death, and it becomes increasingly likely that she would succeed him without a husband by her side, she faces trouble from someone who does not want a woman to govern Roche in her own right. One of the Monriquan Armed Forces' best archers, Lady Katherine Harrington of Johanne is at the lowest point in her life. Desperate for a diversion, she is quick to accept a foreign Emperor's invitation to teach archery at his newly founded women's military academy. However, someone who does not want the initiative to succeed is determined to cause harm to the Emperor, and the students of the academy. Both women are no strangers to injustice. As they struggle with their circumstances, only one question remains on their mind - do truth and justice always prevail in the end? The Blood Legacy begins a new adventure for Isabella, Seth and the gang when a nosy author moves into the hotel to unearth the Foxworthy family secrets. Soon, someone is murdered, and Isabella and Seth must travel to the ghost realm to find out who did it -- if they don't, someone they love very much could be lost to them forever. Thank you and a shout out to my wonderful BETA TEAM for helping out with this book. This story is complete and will be updated frequently. The story of Cinderella's stepsister and the guy who got away...Prince Charming. Stephanie and her cousin, Ellinor, have switched stations in life, but Ellinor isn't quite sure she can handle being a princess all on her own. And Stephanie is certainly sure she can't handle being stuck in the kitchens. Now, that the roles are reversed and some time  has passed since Ellinor's marriage to Prince Dominic, things will start to change again for both ladies. Especially, if their Aunt Felice, also Ellinor's godmother, has anything to say about it. In 1943, Charlotte Truly is a nineteen-year-old American nurse serving in World War II. The oldest of four daughters, Charlotte is mostly a shy and reserved girl who keeps to herself. But when Charlotte meets William McCaden, an injured soldier on leave whom she'd briefly met when she was seventeen, she finds herself falling inexplicably in love. When Will is shipped overseas to Nazi-occupied France to fight in a deadly combat mission, Charlotte and Will have only their letters to keep each other close... but in the midst of war, how can love possibly survive? *Was The Pilot And The Girl*  Evelyne Brown hated the war. But an unexpected encounter with RAF pilot, Jack Collins, makes her forget about that hate and instead focus on something else. The wonderful cover is by Ella (simply1ty)! Thank you so much!